These Edison light bulbs provide warm soft light, which gives great look outdoors. A relaxing warm radiance full glow for outdoor wedding, cocktail party, gazebo, porch, patio, outdoor dining area etc. PERECT VINTAGE LIGHTS FOR ANY OCCASION - These Outdoor String Lights will create a beautiful ambiance to Illuminate your patio, porch, garden, deck, or pergola in an elegant warm glow to mesmerize your family and guest with their glow. A perfect illumination for entertaining in anniversaries, weddings, holiday celebrations, and many other occasions or events. 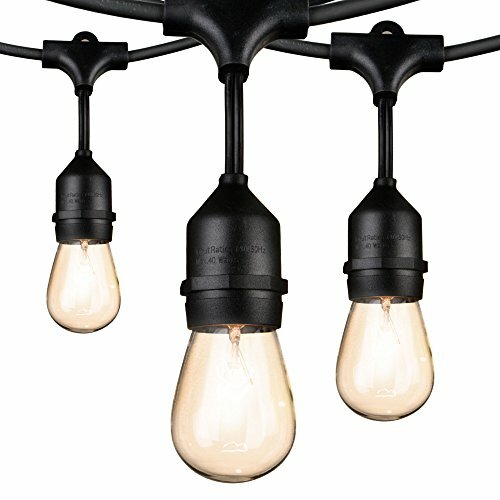 WEATHERPROOF & CONNECTABLE STRING LIGHTS - Our 48 foot black weatherproof lights are designed to withstand the wear and tear of year-round outdoor use. Built with durable WeatherTite technology so that they can withstand extreme temperatures, rainy, windy, or damp climates. Each strand contains 15 hanging bulbs spaced 3 feet apart. You can connect up to 8 strands end to end, so just feel free to customize your arrangements. DIMMER COMPATIBLE LIGHTS -. These 11 Watt S14 Edison bulbs are dimmer compatible. For greater mood lighting flexibility, pls wire lights to a dimmer switch enhance the atmosphere. HASSLE-FREE WARRANTY: We offer 1-Year quality guarantee. If for any reason you are not satisfied with your purchase, please contact the seller directly for any queries and we will be in touch within 24 hours. For spare or replacement bulbs, pls search asin#B00R25TUQQ.